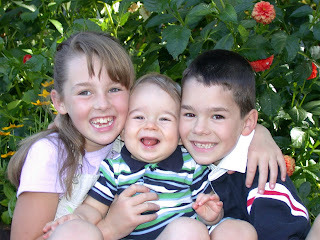 I found this picture recently and love looking at how my children have grown and changed. It's hard to believe that they were so small. Especially Adam. Looking at those chubby little cheeks makes me miss that baby stage so much. But, I also love the other stages since then that we have come upon. Each phase of their life has brought joy, laughter, frustration and excitement for what's yet to come. My children all bring something different to our family and I can't imagine life without them. I am truly blessed to have 3 beautiful children! They are beautiful!!! It is bitter sweet to watch them grow up!